Ahead of International Women's Day, The Telling is bringing Empowered Women, a trilogy of Clare Norburn's concert dramas, to Music at Oxford on 1 and 2 March 2019. The three musical plays celebrate the lives of extraordinary women who defied the strictures of their time, with each story being both of their time but also startlingly contemporary. Vision [which we saw at Brighton Early Music Festival in 2015, see my review] explores the life and music of composer, mystic and polymath Hildegard of Bingen (1098-1179), combining an imagined personal testimony from Hildegard with her own music. Unsung Heroine gives us the imagined history of troubadour Countess Beatriz de Dia (1140-1212), taking audiences back to 12th century Provence with plaintive songs and foot-stomping medieval dances. Finally, Into the Melting Pot celebrates the music and lives of Christian, Jewish and Arabic women in medieval Spain, set just before the expulsion of the Jews in 1492, with Sephardic songs and lively medieval Cantigas and instrumentals which fuse Christian, Jewish and Arabic instrumentation and styles. The Telling features actors Teresa Banham and Suzanne Ahmet with soprano and writer Clare Norburn, mezzo-soprano Ariane Prussner, Giles Lewin on oud, Fatima Lahham on recorders and harpist Joy Smith. Full details from the Music at Oxford website. The Telling is also touring the works across the UK, see the group's website for details. 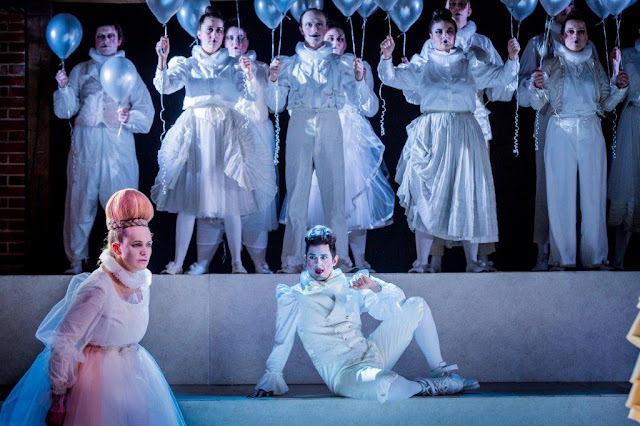 Opera North has announced its plans for the Autumn 2019 and Winter 2020 seasons, with a strong mix of operas including new productions of Martinu's The Greek Passion (receiving only its second ever professional UK production) and Weill's Street Scene, along with revivals of Handel's Giulio Cesare, Britten's Turn of the Screw, Puccini's La Boheme and Mozart's The Marriage of Figaro. Martinu's The Greek Passion, based on a novel by Nikos Kazantzakis, was written for Covent Garden in 1957 to Martinu's own English libretto. Rejected by Covent Garden, Martinu revised the work and it premiered in Zurich in 1961, and it was this version which Charles Mackerras conducted at Welsh National Opera (and recorded) in 1981. 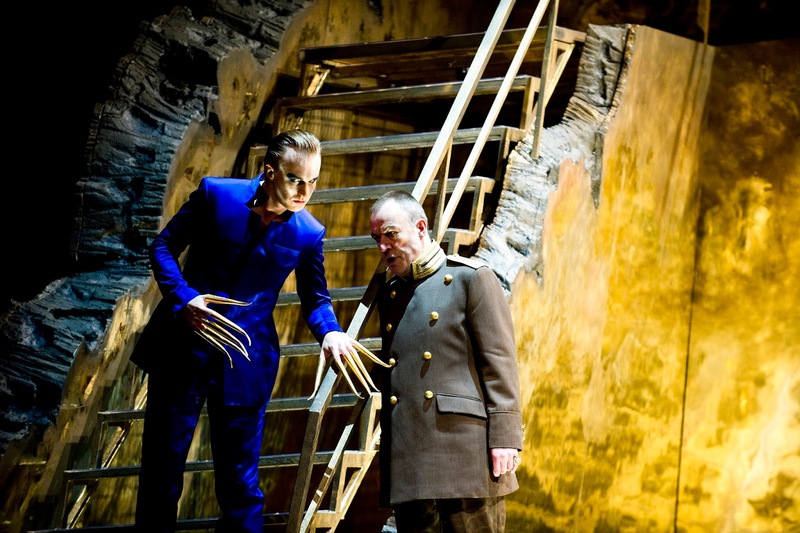 It would take longer for the original version to be performed, it was premiered at Bregenz in 1999 and this production came to Covent Garden in 2000 and 2004. I saw both these two latter revivals, and was knocked out by the work so look forward to the new production. Christopher Alden directs, Garry Walker conducts, with Nick Spence, Magdalena Molendowska, Paul Nilon, Stephen Gadd, John Savournin, Steven Page and Brian Bannatyne-Scott. Kurt Weill's opera Street Scene premiered on Broadway in 1947, with lyrics by Langston Hughes and book by Elmer Rice, based on Rice's play of the same name. For an award-winning, Street Scene has rather an uneven performance history in the UK.There was an important UK revival of the piece in the early 1980s when there was a one-off gala performance at the Cambridge Theatre, I seem to remember Alec McCowen as Harry Easter in a memorable acount of 'Wouldn't you like to be on Broadway' and Janis Kelly sang Rose, a role she would return to in the 1989, David Poutney production which was shared between Scottish Opera and ENO. Strangely, the next professional UK production wasn't until 2008 when the Opera Group performed the work. 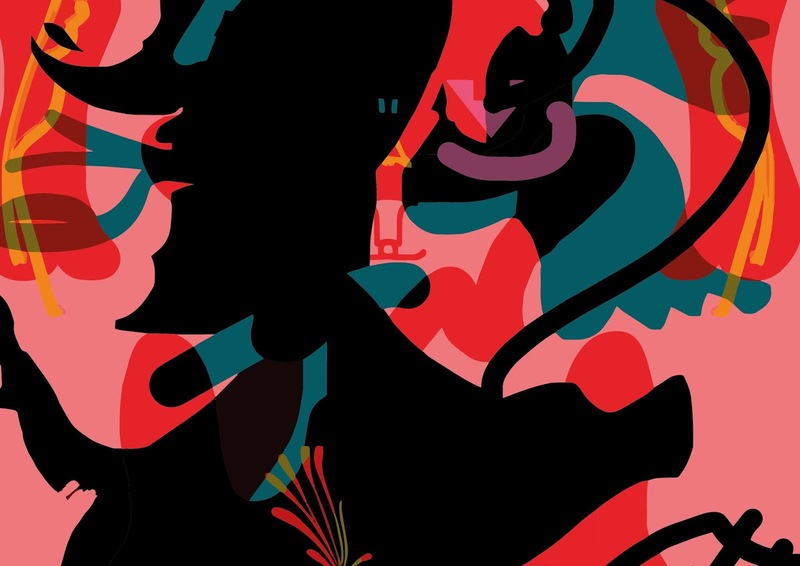 Opera North's new production will be directed by Matthew Eberhardt, who directed Bernstein's Trouble in Tahiti in 2017 [see my review], with Giselle Allen, Robert Hayward, Gillene Butterfield and Alex Banfield, conducted by James Holmes. We missed Tim Albery's 2012 production of Handel's Giulio Cesare first time round, so we are looking forward to this revival with Justina Gringyte in the title role, Sophie Bevan as Cleopatra and James Laing as Tolomeo; Christian Curnyn conducts. Alessandro Talevi's production of Britten's Turn of the Screw returns with Nicholas Watts, Sarah Tynan, Eleanor Dennis, Heather Shipp and Jennifer Clark, conducted by Leo McFall. Handel's opera is famously long and Albery's production inevitably uses a heavily edited version of the score which brings it into manageable proportions for touring. 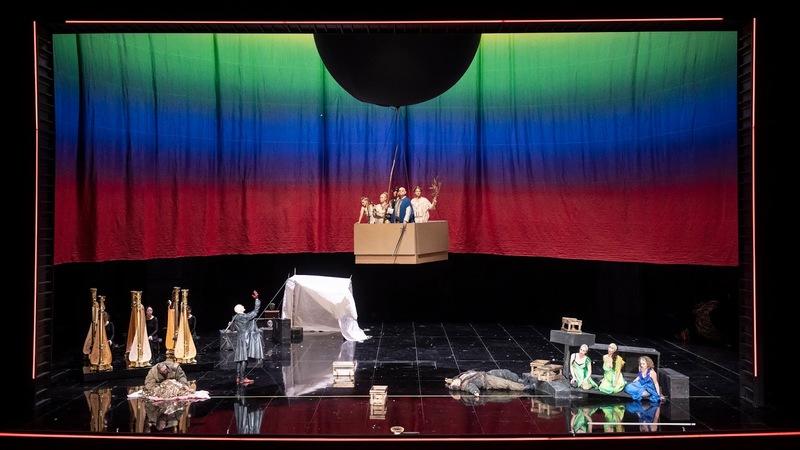 English Touring Opera's performances of the opera uncut, spread across two nights [see my review], showed that the full version of Giulio Cesare is very much an occasional piece for modern audiences. Phyllida Lloyd 1960s-set production of Puccini's La Boheme returns conducted by Renato Balsadonna and Matthew Kofi Waldren, and with a cast including Lauren Fagan, katie Bird, Eleazar Rodriguez, Thomas Atkins, Anush Hovhannisyan and Samatha Clarke. Jo Davies' 2015 production of Mozart's The Marriage of Figaro comes back conducted by Antony herus and James Hendry, with Phillip Rhodes, Fflur Wyn, Quirijn de Lang, Maire Flavin and Heather Lowe. 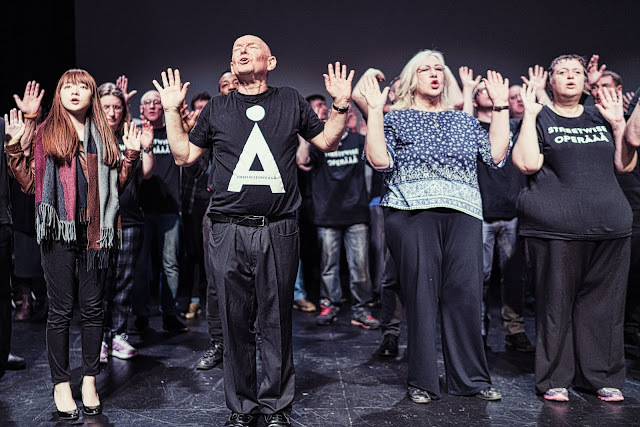 Spring 2020 will include a large-scale community event in County Durham, a new opera written by Will Todd and involving communities from across South and West Durham. Dominic Peckham and the Chamber Choir of London have released the latest of their singles, this time the 'Kyrie' from James MacMillan's early Missa Brevis. MacMillan wrote the mass when he was 17, and only released it 30 years later. The 'Kyrie' seems clearly influenced by the Palestrina the composer was singing at the time, along with a hint of the opening of RVW's Mass. The choir bringings a typical combination of clarity and strength to the performance, with a fine sense of line and a lovely clear demonstration of the purity of the polyphony. Streetwise Opera Manchester. Photo: Greg Kiefer. Streetwise Opera, the arts charity for people who are or have been homeless, wants an hour of your time. If you think you don't like opera, the the charity's new Opera Hours are intended to change minds, presenting opera's raw and authentic passion and epic emotions that can be found in everyday life. The company will be performing scenes from operas by Puccini, Verdi, Gilbert and Sullivan, and others, presented in a spirit of boldness and fun by the performers. The Opera Hour series includes performances in Middlesbrough Town Hall (1/3/2019), Sage Gateshead (21/3/2019), Nottingham Trent University (21/3/2019), Southbank Centre (22/3/2019), Royal Northern College of Music (26/3/2019). All events are free to attend, and audiences may pay what they feel to support Streetwise Opera. 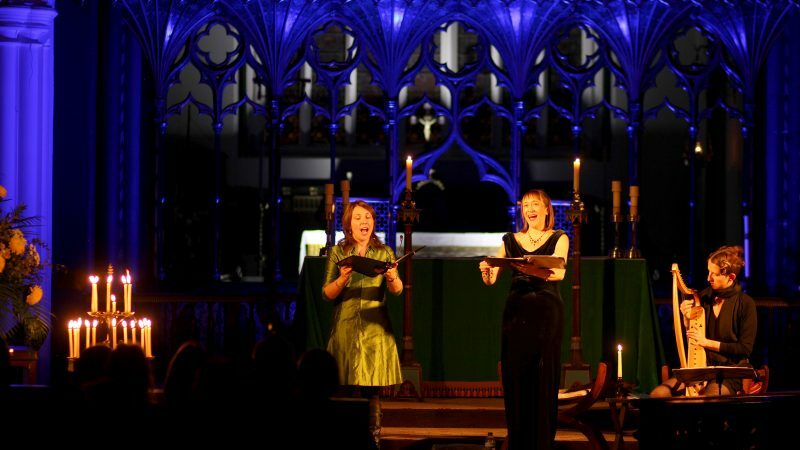 The performances will include the premieres of five choruses created Streetwise Opera’s Composers in Residence: Aurora Nishevci (London), Emily Levy (Manchester), Ian Stephenson (Newcastle and Gateshead), David Wilson (Nottingham) and Hayley Jenkins (Teesside). Full details from the Streetwise Opera website. 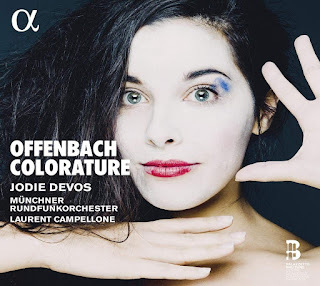 Whether you call it coloratura, soprano d'agilita, chanteuse d'agilite or chanteuse légère, a certain female voice runs through Offenbach's work from his early small scale operettas of the 1850s right through to his final work Les contes d'Hoffmann of 1880. The voice type seems to have had a certain vogue in mid 19th century Paris, during the same period Gounod wrote Juliette (Roméo et Juliette, 1867) and Marguerite (Faust, 1859) for such a voice type, both works tailored to the charms of Marie Miolan-Carvalho, wife of Léon Carvalho who ran the Théâtre Lyrique where Gounod's operas premiered. Offenbach clearly enjoyed writing for the voice type though, there are so many examples. This new disc from Alpha and Palazzetto Bru Zane presents us with a selection of coloratura arias sung by soprano Jodie Devos with the Münchner Rundfunkorchester and conductor Laurent Campellone. 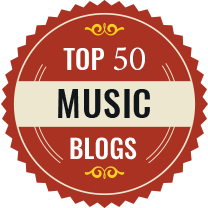 So we have arias from Boule de neige (1871), Vert-vert (1869), Orphee aux enfers (1858), Fantasio (1872), Les Bavards (1862), Mesdames des Halles (1858), Le roi carotte (1872), les contes d'Hoffmann (1880), Robinson Crusoe (1867) and Le voyage dans la lune (1875). The fascination being that the disc gives us examples of Offenbach's writing for coloratura soprano from the smaller scale pieces of the 1850s through the larger scale operas comiques including the fascinating Fantasio which points the way to the final grand opera Les contes d'Hoffmann. 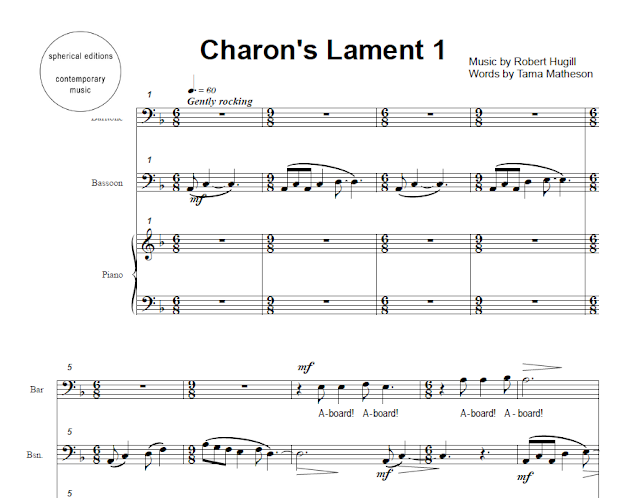 I recently completed to the score to a new song-cycle, Charon's Lament. 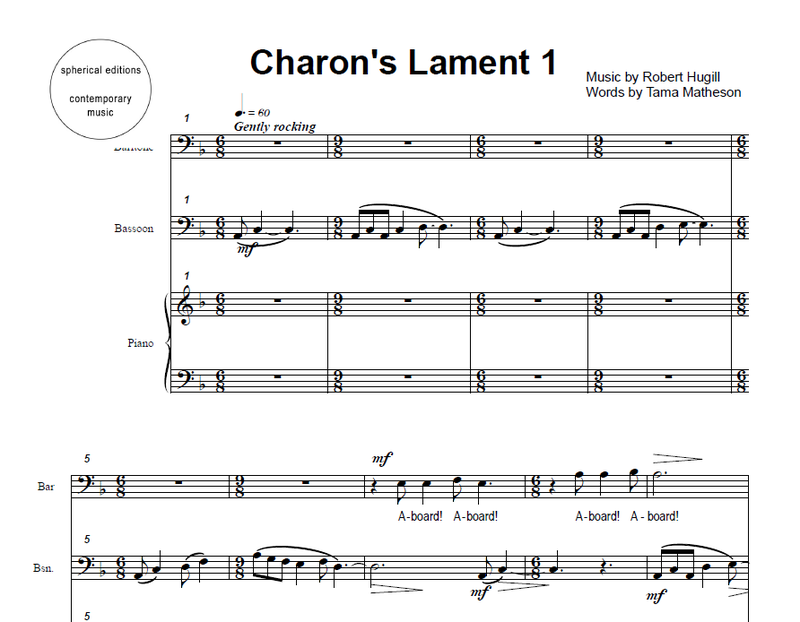 Written for baritone, bassoon and piano, it sets an eleven-poem cycle by the Australian writer, director and actor Tama Matheson. The poems take us into the mind of Charon as he eternally rows the souls of the dead to the underworld. The cycle lasts around 45 minutes and takes the listener on a remarkable journey. We are hoping to organise a performance of the new work, so watch this space. In the meantime, if you want to see Tama in action, he and Davina Clarke are performing Tama's musical interpretation of Byron's life, Don Juan, at the Barnes Festival on 18 March 2019. You can read Tama's complete text after the break. The Southbank Centre's recently announced 2019/20 season naturally has a strong concentration on Beethoven as part of the Beethoven250 celebrations, but alongside this there are contemporary musical responses to the Bridget Riley retrospective at the Hayward Gallery, a celebration of Ravi Shankar's centenary, the complete works of Edgar Varese, and premieres from Philip Venables, Mark-Anthony Turnage, Nico Muhly, Thomas Ades, Georg Friedrich Haas, Sally Beamish, Luke Bedford, Roxanna Panufnik, Jorg Widmann and more. 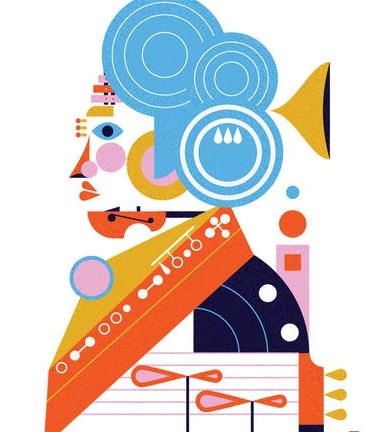 The Beethoven celebrations include Marin Alsop conducting the National Youth Orchestra of Great Britain and 400 performers in Beyond Beethoven, as part of an international mass-participation exploration of Beethoven's Choral Symphony. Another aspect of the exploration of scale is the re-creation of Beethoven's 1808 benefit concert, which took place in a freezing cold hall and lasted four hours and included the premieres of Symphonies five and six, the Fourth Piano Concerto and the Choral Fantasy, along with the concert aria Ah Perfido and movements from the Mass in C. The Philharmonia Orchestra and Esa-Pekka Salonen will be re-creating the 1808 programme, though no doubt the hall's heating will be turned on for the modern audience.. The London Philharmonic Orchestra will be performing all of Beethoven's symphonies as part of its year-long Visions 2020 series, which places Beethoven alongside composers from 100 and 200 years after him. Whilst the Aurora Orchestra will be performing Beethoven's Symphony No. 3 from memory. The Hayward Gallery's Bridget Riley retrospective will be complemented with performances of music responding to Riley's work, including Steve Reich's Drumming (which received its European premiere in the gallery in 1972), a new work from Georg Haas, music by Eliane Radigue and the London Contemporary Orchestra in Michael Gordon's Rushes for seven bassoons, and a recital from guitarist Sean Shibe exploring music from the lute to the electric guitar. Ravi Shankar's centenary is marked by his daughter, Anoushka Shankar, becoming Associate Artist, the London Philharmonic Orchestra will be performing Shankar's final work, the opera Sukanya, Shankar's Symphony receives a performance, and there will be an exhibition of material from the family collection. Mirga Grazinyte-Tyla and the City of Birmingham Symphony Orchestra, and the Birmingham Contemporary Music Group, will be presenting the complete music by Edgar Varese over a single weekend. Edward Gardner will be conducting Bergen Philharmonic Choir and Orchestra in Britten's Peter Grimes with Stuart Skelton in the title role. Music Theatre Wales and the London Sinfonietta will premiere Philip Venables' new music-theatre piece Denis & Katya. Southbank Sinfonia performs music by Anna Meredith and Nicole Lizee. Esa-Pekka Salonen and the Philharmonia premiere Mark-Anthony Turnage's Horn Concerto, marking the start of the orchestra's 75th anniversary. And George Benjamin conducts the orchestra in a programme of his music. The London Philharmonic Orchestra will give the European premiere of Nico Muhly's organ concerto, and the UK premiere of Thomas Ades' piano concerto. Inevitably, Beethoven will be looming large in the concert schedules for 2019/20, and the Barbican's recently announced new season has plenty to enjoy on that score encompassing concerts, exhibitions and new responses to Beethoven's music. Away from Beethoven, the season also includes premieres from Joby Talbot, Emily Howard, Helen Grime, Detlev Glanert, Mark-Anthony Turnage, James MacMillan, Max Richter and Philip Glass. The Beethoven 250 celebrations include the Beethoven Weekender, two full days in February devoted to Beethoven's music. There will be a complete symphony cycle from the Bournemouth Symphony Orchestra, City of Birmingham Symphony Orchestra, Royal Liverpool Philharmonic Orchestra, Royal Northern Sinfonia and the Hall. There will also be an exhibition of artefacts from the Beethoven-Haus in Bonn. Later in theyear, Sir John Eliot Gardiner and the Orchestra Revolutionnaire et Romantique will perform another complete symphony cycle, whilst Andras Schiff performs all five piano concertos with the Budapest Festival Orchestra, and Anne-Sophie Mutter give us the complete violin sonatas. More rarefied fare includes Christ on the Mount of Olives from Simon Rattle and the London Symphony Orchestra, and the complete incidental music to Goethe's Egmont from the Academy of Ancient Music, performed alongside a recently discovered mass by Beethoven's contemporary Dussek. The Academy of Ancient Music's season also continues revealing music by female composers of the past, including the sinfonia from Maria Grimani's oratorio Pallade e Marta. The orchestra will be joined by Benjamin Appl for Bach cantatas as part of a weekend devoted to Bach's music which includes harpsichordist Mahan Esfahani in The Musical Offering and Accademis Bizantina in The Art of Fugue. The BBC Symphony Orchestra premieres Joby Talbot's new opera Everest based on a tragic climbing disaster in 1996, and Sakari Oramo conducts the orchestra in William Alwyn's Strindberg-based opera Miss Julie. The BBC's Total Immersion days include one for Detlev Glannert, including his Requiem for Hieronymous Bosch, and another date devoted to Anders Hillborg. Emily Howard's Antisphere opens the LSO season; other contemporary composers in the orchestra's season include Sophya Polevaya, James Hoyle, Daniel Kidane and Amir Konjani. Helen Grime's new violin concerto receives its UK premiere from Leila Josefowicz, Dalia Stasevska and the BBC Symphony Orchestra, and Victoria Borisova-Ollas' new violin concerto is premiered by the BBC SO with soloist Baiba Skride. The Britten Sinfonia and tenor Allan Clayton give the UK premiere of Mark-Anthony Turnage's Refugee, and the orchestra is joined by The Sixteen for the London premiere of James MacMillan's Symphony No. 5 'Le grand inconnu'. Max Richter's Voices will be premiered by an orchestra featuring 'radically reimagined instrumentation', and Third Coast Percussion will give the UK premiere of a new percussion piece by Philip Glass, along with UK premieres of music by Devonte Hynes and Gavin Bryars. 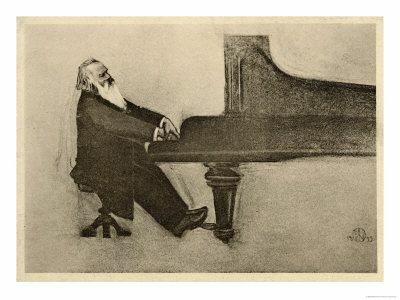 The Institut Français is celebrating the Berlioz 150 anniversary with a programme of talks and concerts in March, and alongside these is the Institut's ongoing Les Salons en Musique chamber music programme which celebrates the restoration of its 1907 Pleyel grand piano (see the video below). The Berlioz celebrations include Fantastic Berlioz on 5 March 2019, an evening of discussion and music, with distinguished conductor John Nelson (who will be conducting Berlioz' Grande messe de morts at St Paul's Cathedral on 8 March 2019) and Berlioz expert Bruno Messina, with live music from soprano Fatima Said. Then on 7 March there is an evening with the distinguished Berlioz scholar, David Cairns, with music provided by mezzo-soprano Jess Dandy and pianist Dylan Perez, plus actor Malcolm Sinclair reading Berlioz' letters and articles. Full details from the Institut website. Les Salons en Musique, which launched in January, continues on 21 March when cellist Benedict Kloeckner and pianist Danae Dörken perform music by Schumann, Shostakovich and Martinu, with a Leonardo da Vinci-themed programme from the Early Music group Doulce Mémoire on 16 May, then violinist Mi-Sa Yang and pianist Jonas Vitaud in Mozart violin sonatas in June. 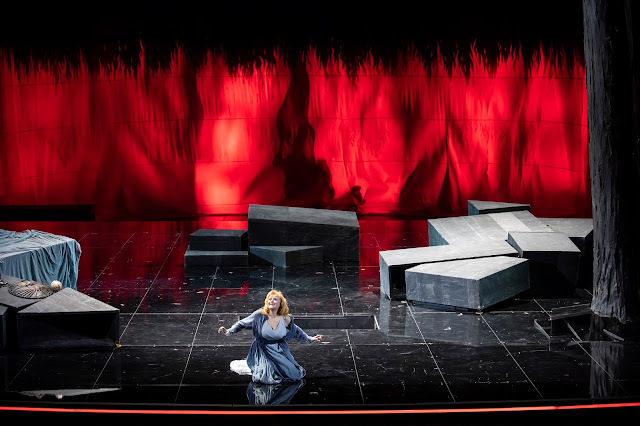 Our roving correspondent Tony Cooper experiences Wagner’s Der Ring des Nibelungen at the Grand Théâtre de Genève directed by Dieter Dorn with Michelle Breedt, Agneta Eichenholz, Tom Fox, Stephan Genz, Will Hartmann, Michaela Kaune, Petra Lang, Wiebke Lehmkuhl, Jeremy Milner, Stephan Rügamer, Taras Shtonda, Mark Stone, Alexey Tikhomirov, Tómas Tómasson, and Michael Weinius, and conductor Georg Fritzsch. 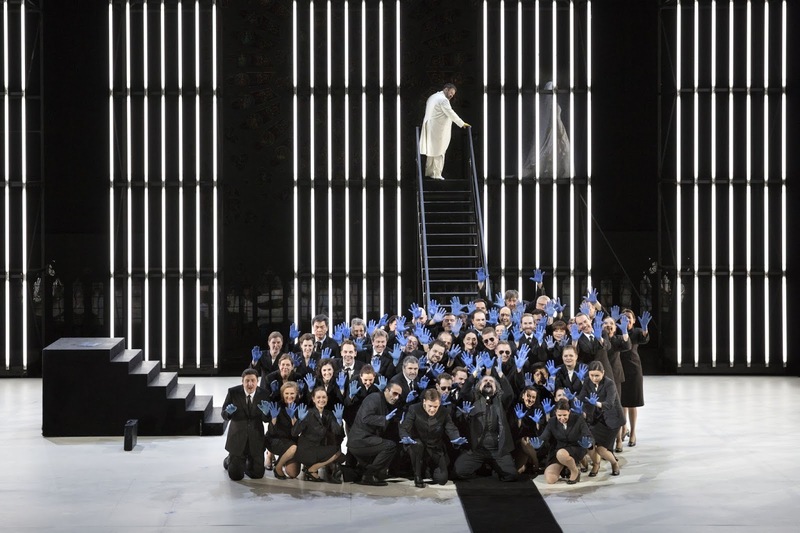 First presented in the 2013-14 season, this Ring cycle (lovingly revived to reopen the grandly-refurbished Grand Théâtre de Genève) was created by the legendary Leipzig-born director, Dieter Dorn, a former director of the Kammerspiele and Staatsschauspiel in Munich and an emblematic and well-loved theatrical personality in Geneva. Designed by Jacques-Elisée Goss, the Grand Théâtre (built during the period from 1875 to 1879) replaced the Théâtre des Bastions but during a rehearsal of Die Walküre on 1st May 1951, the pyrotechnical effects employed for Brünnhilde’s Ring of Fire got out of hand and fire ravaged the building in a savage and brutal way leaving only the foyer space intact. It took 11 years to get the theatre up and running again and it duly reopened on 10th December 1962. Generally, opera-houses have lavishly-furnished interiors adorned with beautifully-designed ceilings such as Marc Chagall’s splendid offering at Opéra Garnier in Paris. It’s a joy to behold but so, too, is the ceiling of the Grand Théâtre. Appropriately entitled ‘Alto’ it was created by Kraków-born artist, Jacek Stryjenski. A glorious and inspiring piece of art, each element comprises a host of silver-leafed, copper-inlaid, brushed aluminium panels embedded with hundreds of minute glass-lights (made from Venetian glass from the island of Murano) representing The Milky Way. Romantically, I like to think that it caught the wandering eye of Wotan dreaming of his heavenly home! Mr Stryjenski (who died in his adopted home town of Geneva at the early age of 38) also designed much of the décor of the Geneva Puppet Theatre. Before the commencement of a three-year restoration programme, costing in the region of £50 million, the last production at the Grand Théâtre (December 2015) was Die Zauberflöte directed by Jürgen Rose who happens to be the set and costume designer for this Ring cycle. During their time in the wilderness, however, the Grand Théâtre decamped to the Opéra des Nations concert-hall sited next to the European headquarters of the United Nations. Interestingly, this structure, built entirely of wood, was recycled from a temporary building used by La Comédie-Française in Paris when that well-loved theatre (widely considered to be the oldest active theatre in the world) underwent a major restoration programme. The city of Geneva acquired the disassembled pieces in the spring of 2014 and when it was rebuilt it was also enlarged and fitted out with red-velvet upholstered seats. Its next stopping-point is Beijing. Normally, it’s companies that tour! The reopening of the Grand Théâtre (a wonderful neo-classically-designed building proudly sitting amidst Place Neuve and officially opened in 1879) coincides with the theatre’s 140th anniversary. Therefore, I cannot think of any better way to celebrate such an auspicious occasion as this than by a performance of Wagner’s Ring cycle. Amazingly, the house pushed the boat out and incorporated three cycles in their opening season. The second cycle commences on 5th March (Shrove Tuesday) and the third a week later - Tuesday (12th March). It’s worth every penny! However, the scenario of the Ring (mainly sourced from Norse sagas and the German epic poem The Nibelungenlied) is a mighty, powerful and adventurous work of great substance and the scale of it is firmly established by those haunting opening bars of Das Rhinegold) - termed a ‘Vorabend’ (Preliminary Evening) by Wagner whilst he coined the three main works of the cycle a ‘Bühnenfestspiel’ (Stage Festival Play) - comprising a low-elongated E-flat major chord lasting just over 130 bars. At first the notes of the chord are firmly held before gradually giving way to a set of broken chords and arpeggios conjuring up ripples of water and when the harps flood in making aggressive sound-like waves evoking the sunrise, it vividly captures and creates a broad and atmospheric canvas of the Rhine and the start of another day. A thrilling piece of writing for sure, it radiated a sense of nervous excitement throughout the vast auditorium of the Grand Théâtre with Georg Fritzsch in the pit with the Orchestre de la Suisse Romande delving deep into Wagner’s mesmerising and compelling score to bring its rich colour and texture to the fore. This year is composer John Casken's 70th birthday year and he has a number of performances coming up. This week, on 28 February 2019, the Halle and conductor Jamie Philips give the premiere of Casken's Trombone Concerto 'Madonna of Silence' with soloist Katy Jones. Casken calls his new trombone concerto, a drama for trombone and orchestra, and the piece is inspired by a Michelangeo drawing in the Portland Collection at Welbeck Abbey. Depicting the Holy Family, Michelangeo gives the drawing the subtitle 'The Madonna of Silence', and Casken calls the drawing intriging and disturbing. You can hear more about his thoughts in his interview with soloist Katy Jones on the Halle podcast. The programme also includes Prokofiev's Fifth Symphony and Mozart's Symphony no. 31 'Paris', full details from the Halle website. Further ahead there are more performances of his melodrama for Sir John Tomlinson Kokoschka’s Doll at the Wigmore Hall (13 April), the Brighton Festival (15 May) and more in June/July, his song cycle Lines from a Wanderer by baritone Marcus Farnsworth, the world premiere of his piano cycle Six Wooded Pieces in Singapore by Kenneth Hamilton (13 April) and two November performances of his Clarinet Quintet ‘Misted Land’ with the Carducci Quartet and Julian Bliss. Further details of other John Casken performances from his website. Founded by Benjamin Britten, Peter Pears and Eric Crozier in 1948, the Aldeburgh Festival, originally centred on the Borough’s cosy and intimate Jubilee Hall in Crabbe Street, seated around 235 but when Britten and Pears conceived the bright idea of turning the Victorian-built malt-house at Snape (situated about five miles inland from Aldeburgh) into an 832-seat venue in 1967, it was a brave decision. But it paid off handsomely and opened up the festival to a new and wider audience while the venue could also attract much larger ensembles and orchestras as opposed to Jubilee Hall. Ambitious as ever, Britten and Pears never stood still and within five years they reclaimed more buildings on the site and established a centre for talented young musicians. The development and expansion of the site continues to this day with the Hoffmann Building housing two excellent spaces suitable for performances as well as a number of additional rehearsal rooms and a social area. The centrepiece of the building (aptly named The Britten Studio, a 340-seat venue) is cleverly designed offering an excellent and flexible acoustic with a high level of sound insulation for recording. The Royal Opera has followed up Mark-Anthony Turnage's opera Coraline [see Anthony's review on this blog], based on a children's novel by Neil Gaiman, with another opera based upon a children's book, thus creating a rather interesting vein of intelligent contemporary opera with an attraction for family and young adult audiences. Gavin Higgins' The Monstrous Child, the first opera at the Royal Opera House's re-vamped Linbury Theatre (seen Sunday 24 February 2019), has a libretto by Francesca Simon (author of the Horrid Henry books) based on her novel for teenagers of the same name. The fact that Turnage and Higgins' operas are both based on children's novels seems to be serendipitous [see my interview with Gavin Higgins], but certainly the audience on Sunday seemed to have a more than a fair smattering of children in the audience. And, judging by the reaction of the children around me the opera seems to have hit the right spot. Gavin Higgins' The Monstrous Child, with a libretto by Francesca Simon, was directed by Timothy Sheader with Marta Fontanals-Simmons as Hel, Tom Randle as Loki, Lucy Schaufer as Modgud, Rosie Aldridge as Angrboda, Dan Shelvey as Baldr, Graeme Broadbent as Odin and Elizabeth Karani as Nanna/Thora, with actors/puppeteers Laura Caldow and Stuart Angell. Designs were by Paul Wills with lighting by Howard Hudson, movement by Josie Daxter, video by Ian William Galloway and sound design by Sound Intermedia. Jessica Cottis conducted the Aurora Orchestra. The story is a re-working of the Norse myth, where Hel is the Queen of the Underworld, half-goddess/half-dead child of the god Loki she is banished there by the Gods following a prophecy that she and her brothers will bring the end of the world. Hel's passion for the Baldr (the only one of the gods to be nice to her) brings things to a head when Baldr dies and enters the underworld. 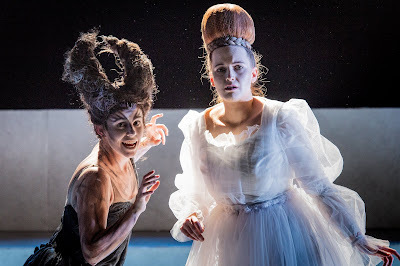 Francesca Simon's clever novel re-imagines Hel as a sulky teenager, and her libretto successfully transfers Hel's distinctive voice into opera. The fact that the teenager uses a lot of one-liners is surely a benefit a composer. A first-time librettist, Simon has successfully created a libretto which allowed plenty of space for Higgins' music. 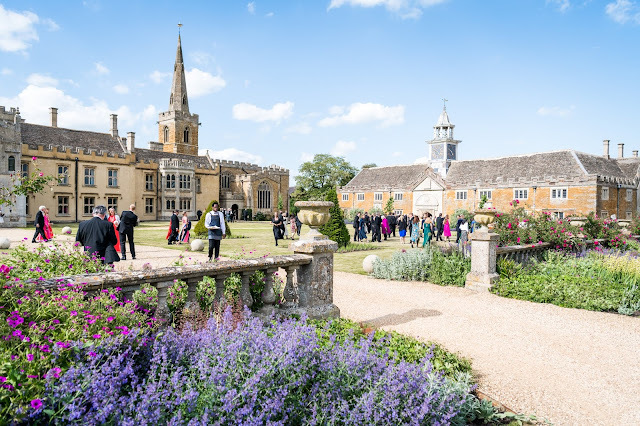 This year, alas, is the final season of Bury Court Opera, the opera festival which takes place in a delightful barn near Farnham which is used as a wedding venue for the rest of the year. And the festival is certainly going out with a bang. The first of the two operas they are presenting is a new commission from Noah Mosley, with Britten's Turn of the Screw next month. We caught the second performance of Noah Mosley's Aurora on Saturday 23 February 2019 at Bury Court Opera, in a production directed by Aylin Bozok and designed by Holly Pigott. Noah Mosley conducted, with Isolde Roxby as Aurora, Dominic Bowe as the Exiled Prince, Katherine Aitken as the Wild Woman, Andrew Tipple as the King, Jean-Max Lattemann as the Mountain Witch and Magid El-Bushra as the Prince and the Owl. In any new opera, the libretto is of prime importance and striking the right balance is difficult. 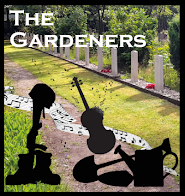 The situation and the plot must appeal to the composer, and the text needs to leave enough space for the music. The libretto of Aurora, by Elisabetta Campeti, is based on an Italian folk tale. Like many such tales, the plot is varied and discursive, which has the advantage of giving plenty of strong and distinctive dramatic situations along with a strong moral. So in Aurora we have a haughty princess dying of a mysterious disease, a wild woman who heals her with a powerful spell, and the princess continuing to use the spell after she is healed, leading to the inevitable punishment from the mountain witch, the princess's gradual coming to self-knowledge, leading to her rescue. Campeti, has however, kept a lot of the twists and turns which, interesting in a story, threaten the drama with loss of focus. An interesting exercise is to compare the way Henry Newbolt's libretto for Stanford's The Travelling Companion, recently revived by New Sussex Opera [see my review] stripped away a lot of the incidental detail from Hans Christian Anderson's story to create a focused drama. Campeti's libretto lacked this focus, and the essential point of the drama seemed to be in danger of being lost in the imaginative detail. I have to confess that I also found Campeti's style of writing too wordy, and wanted less here also; the characters' tendency to state who they were became rather wearisome, and some of the essential mechanics of the plot were a bit unclear. 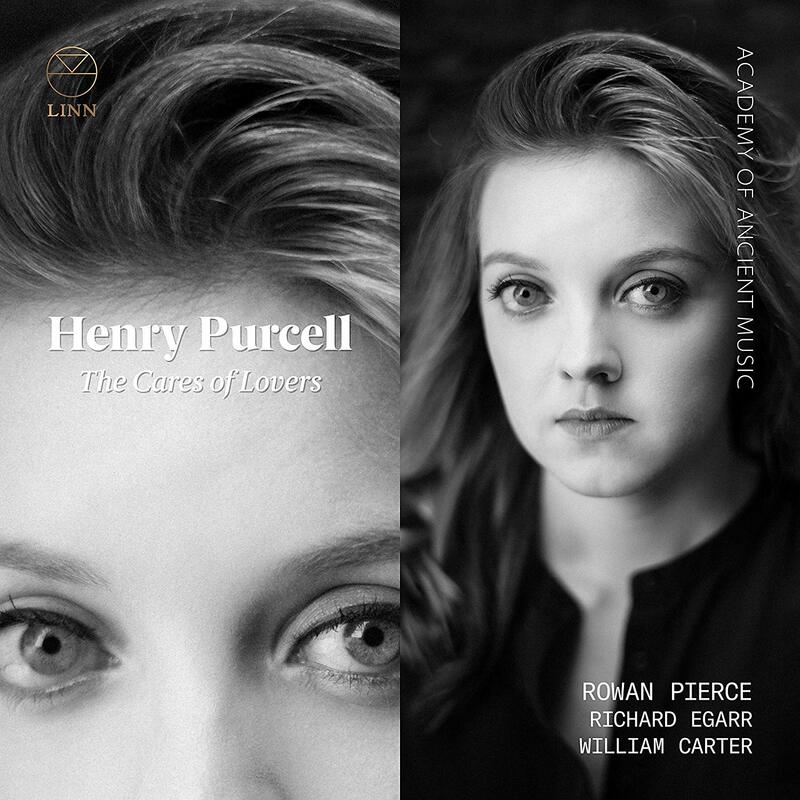 At the beginning of last year (2018) we heard soprano Rowan Pierce and lutenist William Carter in a private recital of Purcell songs which was a taster for a forthcoming recording, what would be Rowan Pierce's debut recital. 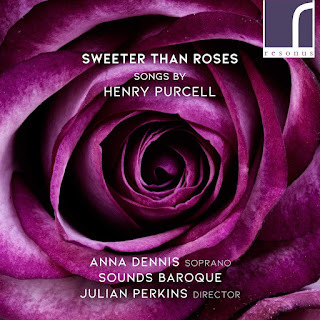 The disc has now been released on Linn Records, with The Cares of Lovers featuring Rowan Pierce, Willliam Carter and harpsichordist Richard Egarr in a wide selection of Purcell's songs from one of his very first published pieces (1683), to Sweeter than roses from his final months (1695). Last night (22 February 2019) the CD was launched with an audience of friends and supporters at St George's Church, Hanover Square with Rowan Pierce, William Carter and Richard Egarr. They performed three groups of Purcell's songs, first a contrasting selection of his secular songs, The Care, Dear Pretty Youth, The Fatal Hour, and Sweeter than Roses, then a group of theatre songs If music be the food of love, Celia hath a thousand charms, o ldead me to some peaceful gloom and She loves and she confesses too, and then finally three more serious songs, Music for a while, The Morning Hymn and The Evening Hymn. In between Egarr played Byrd's The Bells and Carter played Dowland's chromatic fantasia The Farewell. Despite the largeness of the acoustic, Pierce's diction was admirable and I certainly look forward to hearing the disc. She brought a lovely range of colour and character to the songs without ever veering to far into the operatic, and was finely supported by Egarr and Carter. The disc is available from Linn Records, and on-line. 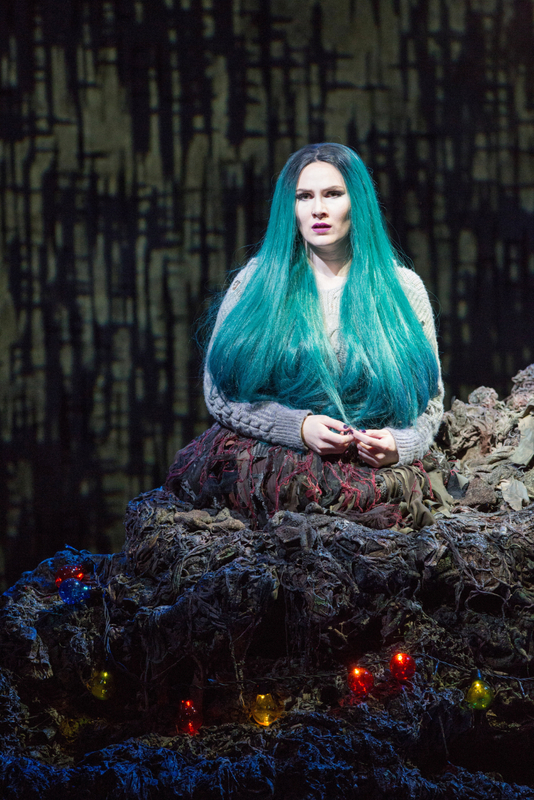 Rowan Pierce is appearing as Papagena in Mozart's The Magic Flute in English National Opera's revival of Simon McBurney's production which opens on 14 March 2019, see ENO website. Gavin Higgins' new opera The Monstrous Child opened at the Royal Opera House's Linbury Studio on Thursday (21 February 2019, in repertory until 3 March 2019) with Jessica Cottis conducting, and in fact Jessica has been involved with the opera since the first workshops at Covent Garden [see my interview with Gavin Higgins]. I met up with Jessica recently to talk about the new opera and new music in general, and topics as diverse as how everyone should have access to music, how she finds programming concerts fun, the importance of the CBeebies Prom and her passion for flying helicopters. When I met Jessica she had come straight from rehearsals of The Monstrous Child, and was carrying a large bag containing a thick A4 vocal score, and a very substantial A3 full score, beautifully laid out and with all of Jessica's own notes. This led us to start with a discussion about the complexity of musical notes and conveying the necessary information, that a conductor needs to work beyond the notes themselves. For any production of a new opera, the notes in the composer's head need to be translated so that they can be read by other people. And for the process of creation to work smoothly, this translation needs to happen as quickly as possible. Jessica sees it as a language issue, a conductor needs to learn what it is the composer is trying to achieve, what the sounds which correspond to the musical notations are intended to be. With a composer whose work she knows, Jessica finds it easier to understand what the composer intends with a new score. Jessica recently did a new piece by Laura Bowler, Antarctica, with the Manchester Camerata. Jessica had worked with Laura on one of her other scores a year ago and that meant that, despite the passage of time, the process of understanding Laura's musical language was much faster this time around. With Gavin Higgins' The Monstrous Child, Jessica was involved in the very first workshops on the piece, alongside Kasper Holton at the Royal Opera House. Though she had heard Gavin's music before, this was the first score of his that she worked on and this early introduction to the composer's language was very helpful. She felt very privileged to be involved in what was a very collaborative creation process, and this far into the rehearsal process Jessica knows what Gavin wants. Whilst he communicates very clearly in the score, the inevitable limitations of musical notation mean that this personal interaction with the composer is very important as Jessica learns his language. The Mari Lwyd (the grey mare) is an old wassailing folk custom found in South Wales, involving a hobby-horse, so it seems appropriate that the Welsh composer Mark Bowden's new work The Mare's Tale inspired by the tradition of the Mari Lwyd will be receiving its premiere in a tour by the Berkeley Ensemble which centres on St David's Day on 1 March 2019. 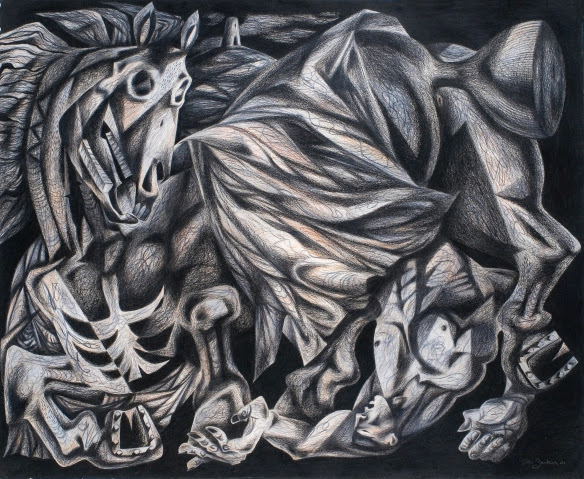 Bowden's The Mare's Tale is a work for actor and chamber orchestra using similar forces to Stravinsky's The Soldier's Tale. Bowden was inspired by a series of drawings by Clive Hicks-Jenkins on the theme of the Mari Lwyd and the work uses a specially commissioned text from Damian Walford Davies. The Mare's Tale was originally commissioned by the Mid Wales Chamber Orchestra and received a workshop performance to a private audience, but the Berkeley Ensemble's performances represent the work's first public performances. The Mare’s Tale is a psychological drama focussing on the central character Morgan Seyes. Devastated by the death of his wife Jane, Morgan returns to the village of his childhood; an old pub sign reignites memories of a terrible experience from his past. The score underpins the psychological and poetic tension in the text and is cast as a set of dark variations on a traditional Welsh Mari Lwyd ballad, traditionally sung by bawdy revellers in South Wales demanding entrance to homes on New Year’s Eve. 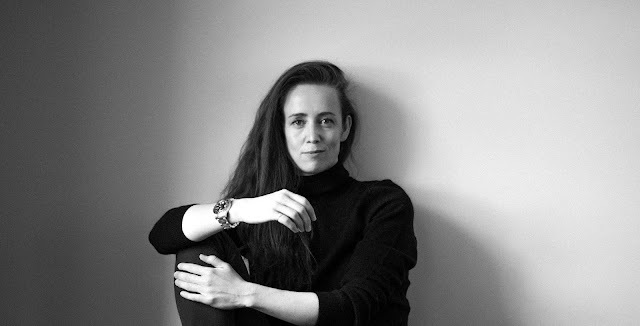 Chloe van Soeterstede will conduct the Berkeley Ensemble with actor Eric Roberts with performances at the Royal Welsh College of Music and Drama in Cardiff (28 February 2019), St. Saviour's Church, Warwick Avenue, London (1 March 2019) and Glasgow Cathedral (in September). Full details from the Berkeley Ensemble website. Benjamin Britten's Violin Concerto was premiered in New York, with a Spanish violinist, an English conductor and an American orchestra (Antonio Brosa, John Barbirolli, New York Philharmonic Orchestra), and it has remained a work which has had an interesting career with performers from outside of the UK. 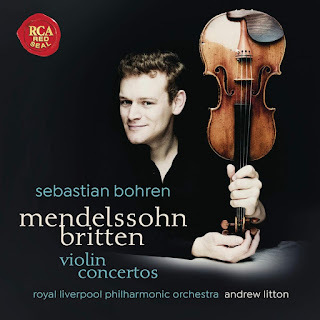 On this new disc from RCA Red Seal, we have a Swiss violinist, American conductor and English orchestra; the young Swiss violinist Sebastian Bohren is the soloist in Britten's Violin Concerto with the Royal Liverpool Philharmonic Orchestra and Andrew Litton, in a programme which also includes Mendelssohn's Violin Concerto in E minor Op.64 and Tchaikovsky's Serenade melancolique Op.26. Britten's concerto was written in the late 1930s, premiered in 1940 and revised in the 1950s. Interestingly there seems to be a recording of Brosa, made in 1952 with Ian Whyte and the BBC Scottish Orchestra though I am not sure if it has ever been issued on disc. The work's early recorded history is patchy, and Britten himself did not record it until 1970 with Mark Lubotsky, but since then many major figures have attacked the work. The work opens with that wonderful bitter-sweet melody on the violin over the striking rhythmic figure in the orchestra, a combination which I have always found very magical. 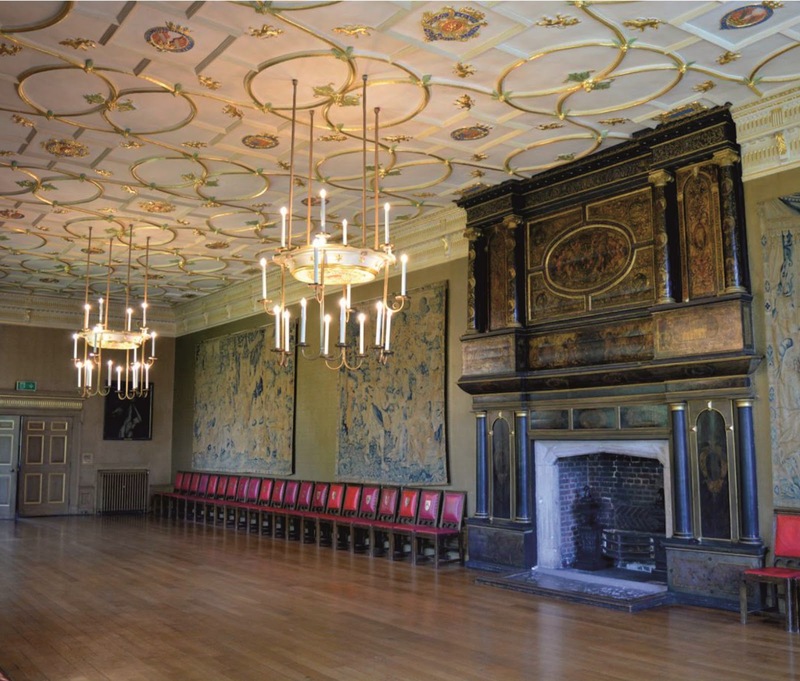 The London Handel Players are starting a new concert series in the Great Chamber at the Charterhouse, near the Barbican. The concerts are on Sunday afternoons with the first of the series on Sunday 24 February 2019, and each concert is given twice, at 2.30pm and at 4.pm. The first programme is of Handel and Corelli solo and trio sonatas, and further ahead there are Handel and Telemann solo sonatas and quartets (17/3/2019), Handel's Flute Concerto and Gloria, and Bach's Cantata No. 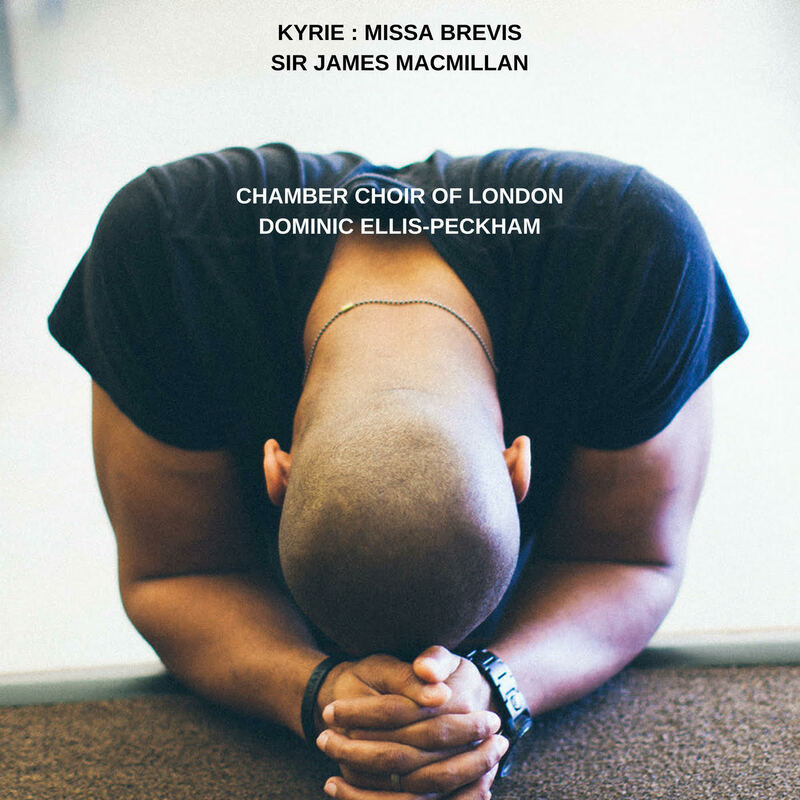 182 with Rachel Brown and soloists from the Royal College of Music (14/4/2019), and Handel and Vivaldi arias and concertos with mezzo-soprano Helen Charlston who won the 2018 Handel Singing Competition (5/5/2019). The Charterhouse was originally a Carthusian monastery which, after the Dissolution of the Monasteries, was re-built as a private house which became a school and then almshouses. The Charterhouse remains almshouses, but the historic core of the site is now open to the public. The Great Chamber dates from the Tudor period when the private house was created on the site. Further information from the London Handel Players website or The Charterhouse website. Tickets for the first concert from EventBrite. Beethoven's music for Goethe's play Egmont is best known for the overture which has rightly developed an independent life of its own. 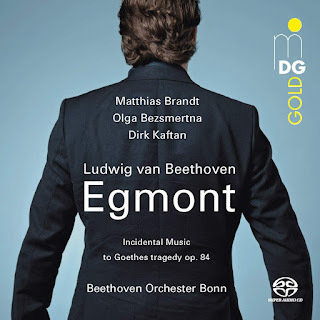 On this disc on the Musikproduktion Dabringhaus und Grimm (MDG) label, the Beethoven Orchester Bonn and conductor Dirk Kaftan give us the complete incidental music with nine numbers in addition to the overture. The orchestra is joined by soprano Olga Bezsmertna, and actor Matthias Brandt gives a spoken narration based on Goethe's play. Beethoven wrote the music in 1809 and it premiered in 1810 with Goethe highly praising it. Coming two years after Beethoven completed his Symphony No. 5 the subject of the play, the heroic sacrifice of a man condemned to death, chimed in with Beethoven's own political concerns at the time. The music is not extensive, of the disc's 45 minutes duration some ten minutes is taken up with Matthias Brandt's narration. Simply, Goethe's tragedy about the Protestant revolt in 16th century Netherlands, very much a play of ideas, does not have the need for extensive musical contributions. The biggest is the Victory Symphony which plays at the end, counterpointing Egmont's execution with an image of the Netherlands' ultimate freedom. Beethoven pre-figures this by using the music from the Victory Symphony at the end of the overture, complete with the important piccolo part associated with Egmont's sweetheart Klärchen. Pianist Kirill Gerstein returns to the Wigmore Hall on Sunday 24 February 2019 with a typically thought-provoking programme which includes the UK premiere of Thomas Adès’ Berceuse from his opera The Exterminating Angel [see my review of the premiere of the opera], a work which Adès wrote for Gerstein and which Gerstein premiered last week in Vienna. Also this week, Gerstein's new CD of Feruccio Busoni's mammoth Piano Concerto comes out, and looking ahead Gerstein and Adès will be collaborating on the premiere of Adès Concerto for piano and orchestra which is dedicated to Gerstein. 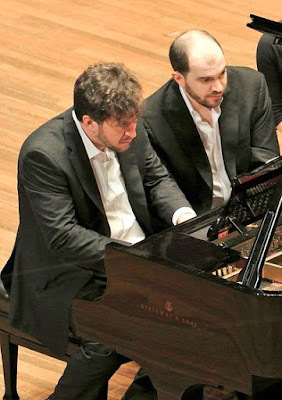 At the Wigmore Hall, Gerstein's programme brings together pieces written in response to social and political turmoil, including music Liszt, Beethoven, Janáček, Debussy, Ravel and the Armenian composer Komitas (1865-1935). Further details from the Wigmore Hall website. Long-time friends, Gerstein and Adès will give the premiere of Adès' Concerto for piano and orchestra with the Boston Symphony Orchestra in Boston (7 March), New York (20 March), [see the orchestra's website] and subsequently its European première in Leipzig (25 April), and in New York and Boston the two will collaborate on two-piano recitals including Adès’s Concert Paraphrase on Powder her face. Gerstein's recording of Busoni's Piano Concerto was recorded live with Boston Symphony Orchestra and Sakari Oramo in March 2017 and the disc is out this week on Myrios Classics. Written in 1904, Busoni's concerto is one of the largest works written in this genre, lasting around 70 minutes with the addition of a male chorus for the final movement. Busoni himself was the soloist for the premiere in Berlin's Beethoven-Saal with Karl Muck conducting the Berlin Philharmonic Orchestra. 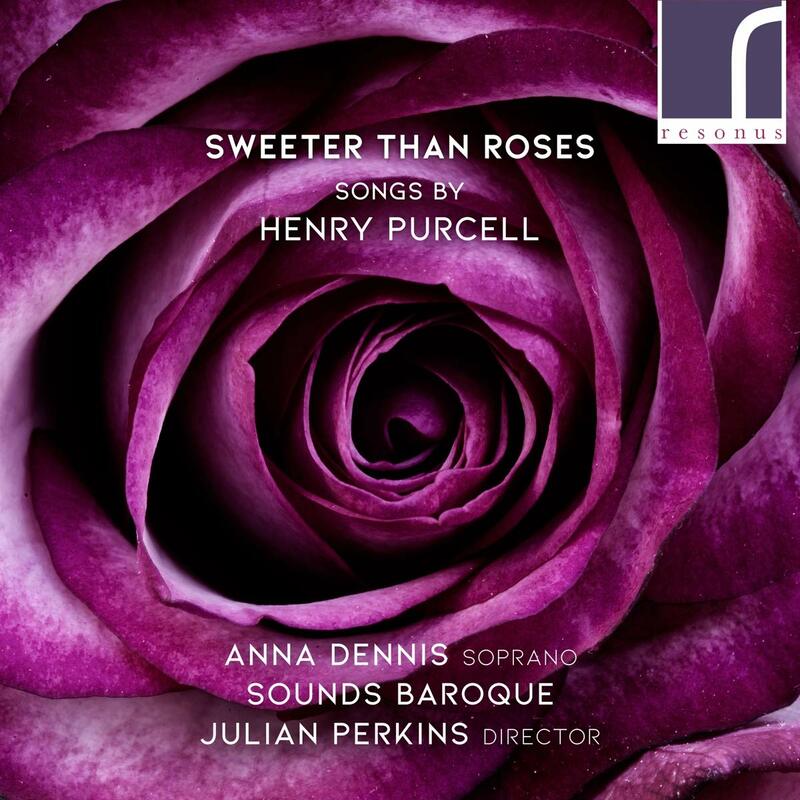 This new disc on Resonus Classics from soprano Anna Dennis and Sounds Baroque, director Julian Perkins, is based around a programme which we caught at Conway Hall in 2017 [see my review]. The centrepiece of the disc is a sequence of Purcell's songs, from Sweeter than Roses to In the black, dismal dungeon of despair from An evening hymn to How blest are shepherds from King Arthur. Alongside Purcell's music we have instrumental by Purcell's contemporaries, a guitar suite by Francesco Corbetta and a harpsichord suite by Giovanni Battista Draghi, and a pair of songs by Purcell's older contemporary Henry Lawes. Julian Perkins' article in the booklet explains how the selection of material on the disc was made to bring out the sheer variety of Purcell's songs. Consent and Communication at Work: a training day for performers at opera is running at Paines Plough on Sunday 24 February 2019. Theatre company Paines Plough has partnered with Houselights and Intimacy Directors International UK to offer a training day for onstage performers in opera. The day will include discussions and practical explorations of how to use intimacy tools to create safe, consented visual moments, workshops on the multitude of ways harassment manifests in our industry, plus industry panels and discussion. The workshops are open to all singers in training, and to onstage performers at any stage of their career. Update: Though the event is at Paines Plough HQ, and they've been supportive by donating the space for free, they haven't organised it. There's more info on HERA's website (www.wearehera.co.uk). 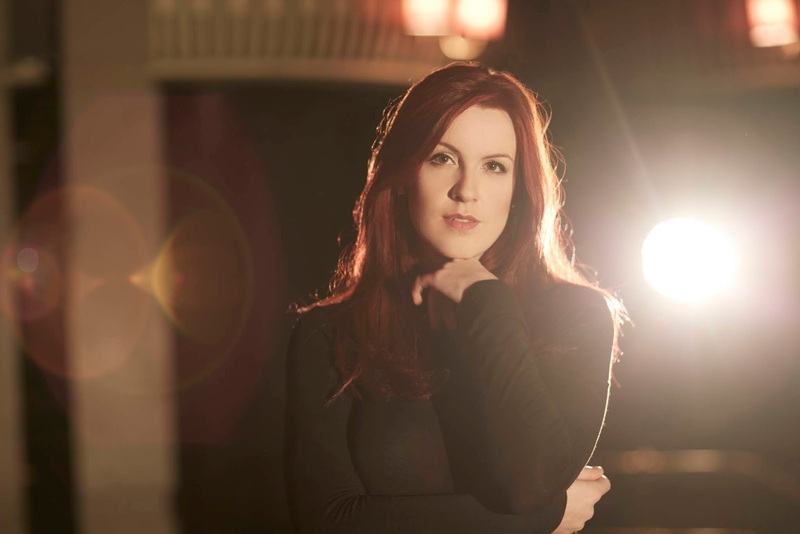 In her interview with me last week, mezzo-soprano Kitty Whately talked about the need to be imaginative in programming more music by women composers. For their BBC Radio 3 Lunchtime Concert at the Wigmore Hall on Monday 18 February 2019, Kitty Whately and pianist Simon Lepper cast their eye not only over women composers but women writers too. From the Pens of Women showcased 20th and 21st century songs setting texts by Ursula Vaughan Williams, Margaret Atwood, Virginia Woolf and Edna St Vincent Millay with music by Jonathan Dove, RVW, Judith Cloud, Lori Laitman, Dominick Argento, Rebecca Clarke, and Juliana Hall. The programme was bookended with music by Jonathan Dove, opening with songs from his 2004 cycle All the Future Days, setting Ursula Vaughan Williams, and ending with his 2015 cycle Nights Not Spent Alone setting Edna St Vincent Millay, commissioned by the BBC for Kitty Whately. Following Dove's Ursula Vaughan Williams settings we heard RVW's Four Last Songs, also setting his wife's words. Two contemporary American women composers provided settings of poems by the Canadian writer Margaret Atwood, Judith Cloud's 'Variations on the Word Sleep' from Night Dreams (2006), and Lori Latiman's 'I Was Reading A Scientific Article' from Orange Afternoon Lover (2006). Dominick Argento's 'Anxiety' from From the Diary of Virginia Woolf (1974) gave us a glimpse of the great British writer, and then the final section moved to Edna St Vincent Millay with Rebecca Clarke's Lethe (1941), two songs from Juliana Hall's Letters from Edna (1993), and ending with the Dove. It was an imaginative concept, and the sense of the women's poetry and texts threaded its way through the concert with different composers providing different approaches, but all seemed to prioritise the text. To a certain extent, by calling the concert From the Pens of Women, Kitty Whately was making a rod for her own back as the text needed to have some priority. But throughout the concert her diction was superb so that we hardly needed the song sheets, and in each song Whately and Lepper gave us a remarkable combination of text and music. The Czech composer Josef Mysliveček remains best known as a friend and influence on Mozart. 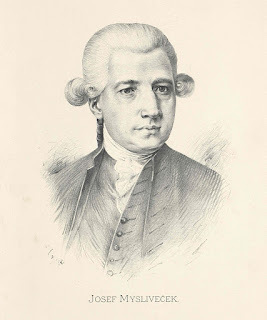 Nearly twenty years older than Mozart, Mysliveček was based in Italy for most of his adult life and met the young composer in Bologna in 1770 (when Mozart was 14) and the Mozarts remained close to Mysliveček for the remainder of the decade. As a composer, Mysliveček provided numerous models for Mozart's own composition. But Mysliveček's music only occasionally comes out on its own.This week there is a chance to her flautist Ana de la Vega performing Mysliveček's Flute Concerto, a work she has recorded with the English Chamber Orchestra [available on-line], further ahead pianist Clare Hammond will be releasing a disc of Mysliveček's keyboard music. On Tuesday 19 February 2019 at Cadogan Hall, Ana de la Vega will be the soloist in Mysliveček's Flute Concerto with the English Chamber Orchestra, director Stephanie Gonley, in a programme which also includes Mozart's Flute Concerto in D. Mozart famously disliked the flute, but his two flute concertos remain corner-stones of the repertoire and this combination of Mozart and Mysliveček gives us a chance to hear the influence of the older composer on the younger. Full details from the Cadogan Hall website. Pianist Clare Hammond's disc of Mysliveček's complete keyboard music will be released on BIS, and will encompass not only his works for solo keyboard but his two keyboard concertos with Nicholas McGegan and the Swedish Chamber Orchestera. The recording of the second concerto will be the first time it has been issued on disc. Both concertos dates from the late 1770s, towards the end of the period of Mysliveček's friendship with Mozart. The disc will be released on 10 March 2019. Rather embarrassingly, this disc made it onto the wrong pile, so instead of including it in my 2018 Christmas CD round-up, I am listening to a disc of music for Advent and Christmas in the middle of February. But it is a disc worth listening to. 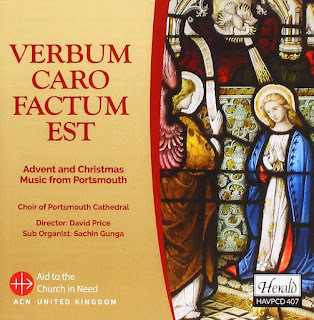 For Verbum caro factum est on Herald AV, David Price and the choir of Portsmouth Cathedral have recorded a selection of music which they performed at carol services during 2017. 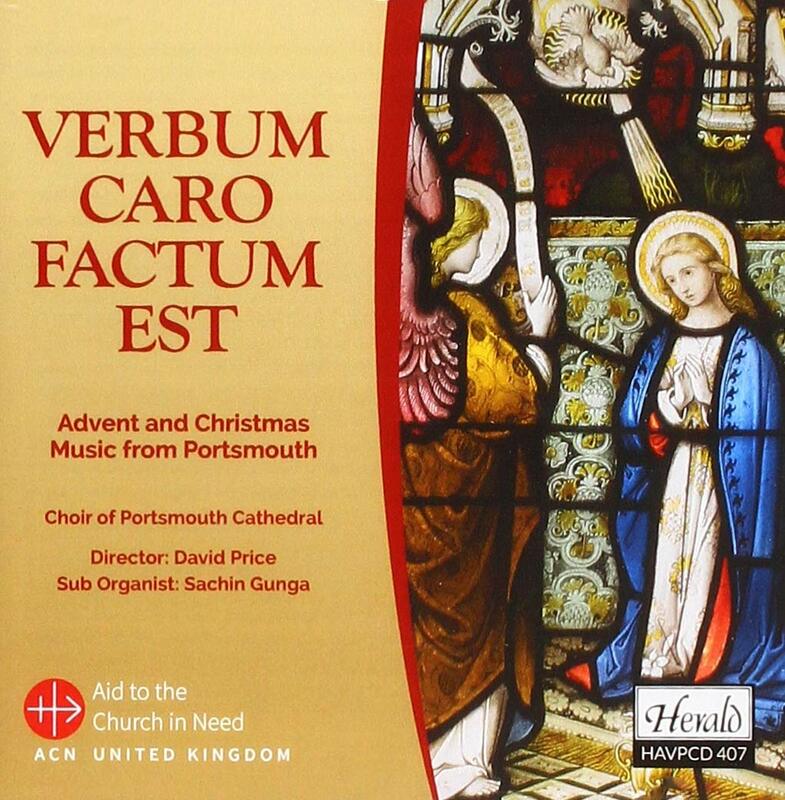 In his booklet note, Price comments that the cathedral hosts a huge number of carol services from the beginning of Advent right through to Epiphany. On the disc, the cathedral choir is made up of nearly 30 boys with fifteen Lay Clerks and choral scholars. A second group, Cantate, features the girl choristers along with teenage boys, and there is also a third group on the disc, the Cathedral Consort which features adult singers, with different tracks being performed by different combinations of these three. The repertoire on the disc is wonderfully unhackneyed, and though many pieces are perhaps familiar to choristers and choir members, they form an attractively unusual selection. To celebrate Valentine's Day (14 February 2019), Temple Music Foundation presented a programme of love songs at Temple Church, with Gemma Summerfield (soprano), Fleur Barron (mezzo-soprano), James Way (tenor), Julien van Mellaerts (baritone), Julius Drake and Stacey Bartsch (piano) in Brahms' Liebeslieder Op.52 and Neue Liebeslieder Op.65, and Schumann's Spanische Liebeslieder Op.138. Whilst Schumann's cycle, written in 1849, is often seen as one of the inspirations for Brahms' two sets of waltzes (1869 and 1875), the sets are rather different with Brahms creating a sequence of waltzes mainly for an ensemble of four voices, and Schumann effectively writing a song-cycle for multiple voices with all four coming only at the end. Brahms love song waltzes are remarkably good tempered, there is little anguish here and Richard Stokes in his article in the programme book suggests that one of their inspirations was Brahms 'timid but intense' love for Clara Schumann's daughter Julie (who went on to become engaged to someone else later in 1869). Whilst Brahms would develop great admiration for the waltzes of Johann Strauss II (the two became friends later in the 1870s and Brahms would write a counter-melody for one of Strauss' waltzes), the inspiration for the Liebeslieder Walzer is closer to Schubert's Ländler (a folk dance which was an early predecessor of the waltz), 20 of which Brahms arranged for piano duet. Whilst the Op.52 Liebeslieder were still in manuscript they were performed as piano duets (without voices) at Clara Schumann's, and with voices at the conductor Hermann Levi's, and Brahms himself was undecided as to how to describe them, ultimately the Op.52 set would be published as Waltzes for piano, four hands (and optional voices). Whilst later performances have expanded the vocal contribution to a choir, an ensemble of four voices seems more in keeping with the work's domestic origins. For all the brilliance of Brahms' writing, these are songs to be sung round the parlour piano. It was perhaps unfortunate that the concert was presented in the rich acoustic of Temple Church, rather than in the more intimate surroundings of Middle Temple Hall.